An unusual combination of ingredients results in a truly refreshing salad. The juicy watermelon and creamy mozzarella work so well together, and the balsamic vinegar adds just the right touch of acidity. 1. Toss together watermelon, mozzarella, chopped basil, scallions, and oil. Season with salt and pepper to taste. 2. Spoon salad over baby greens. 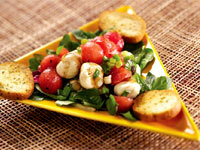 Drizzle with balsamic vinegar and serve with crostini on the side.